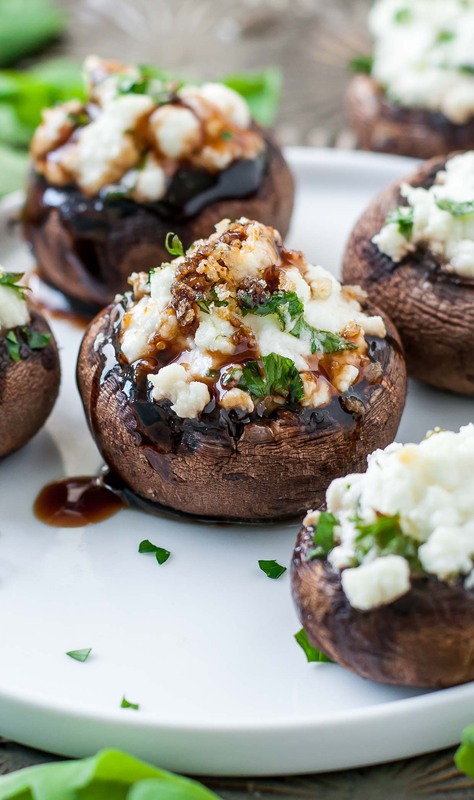 These herbed goat cheese stuffed mushrooms are piled high with savory whipped goat cheese, spiked with fresh herbs, and drizzled with a sweet + savory balsamic reduction to make them over-the-top delicious. 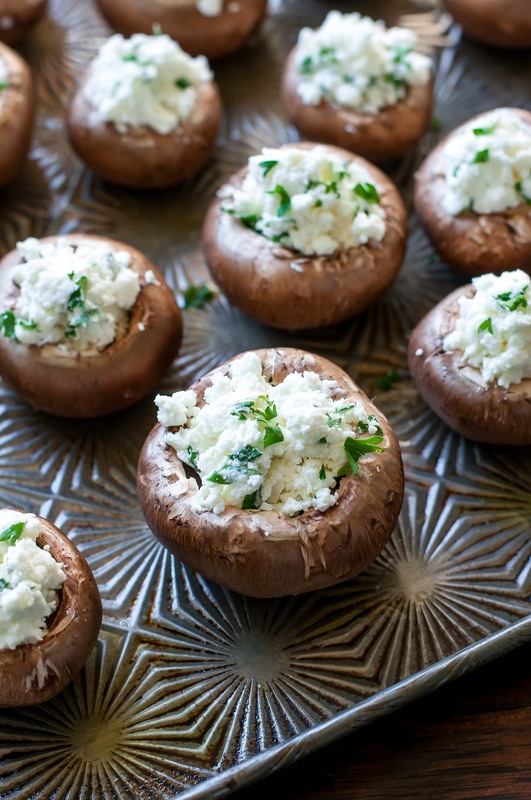 We’re huge fans of stuffed mushrooms around here! With 5 different recipes on this site and counting, I almost consider them their own food group at this point. I’d say this is the last one for a while but we all know I’ll never quit stuffing my veggies. At a recent trip to South Market, I faceplanted into the most glorious herbed goat cheese stuffed mushrooms. I couldn’t stop eating them! 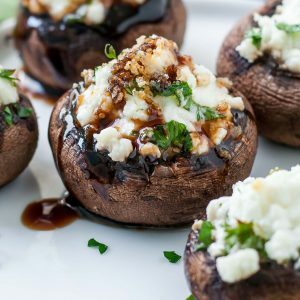 Each mushroom was piled high with savory whipped goat cheese, spiked with fresh herbs, and drizzled with a sweet an savory balsamic reduction that rendered them over-the-top delicious. Recreating them at home was a total no-brainer! I added an optional dusting of toasted panko on top and served this snazzy app on a bed of arugula because, veggies. I could wax poetic on them all day but it’s way better for both of us if I send y’all into the kitchen with the recipe! Let’s jazz up our appetizer game! As written, this recipe yields about 28-30 mushrooms but it’s so incredibly easy to make more or less to cater to the occasion. Make a small plate as a romantic appetizer for two (date-night I’m looking at you!) or make a metric ton for your next party or potluck. But let’s be honest here, you can totally make a tray of these by your lonesome and pop ’em in your face while re-watching Stranger Things for the third time. Not that I know from experience or anything. Bonus point’s if you’re wearing sweatpants. Let's jazz up our appetizer game! 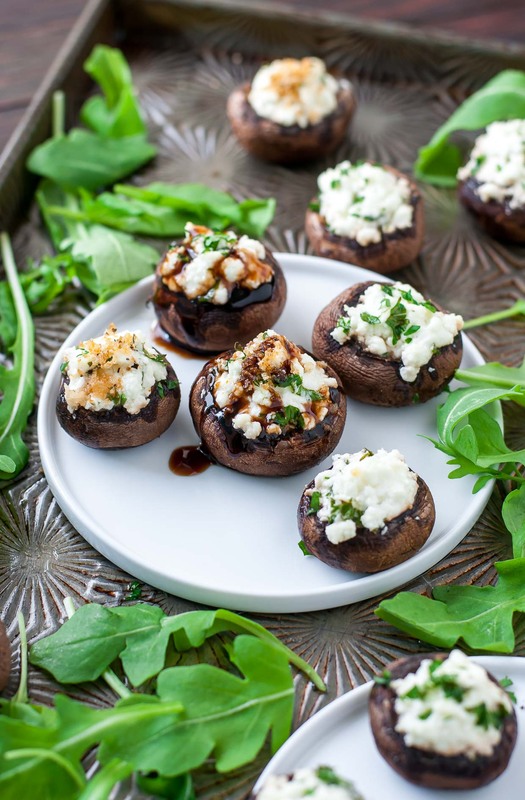 These herbed goat cheese stuffed mushrooms are piled high with savory whipped goat cheese, spiked with fresh herbs, and drizzled with a sweet + savory balsamic reduction to make them over-the-top delicious. First up, do you have a hand mixer? FAB! Use it to whip your goat cheese into fluffy amazingness. You could also use a small food processor to do the trick or let the goat cheese get ultra soft at room temperature, add a little drizzle of honey, and mix it up with some elbow grease and a fork. Game on. 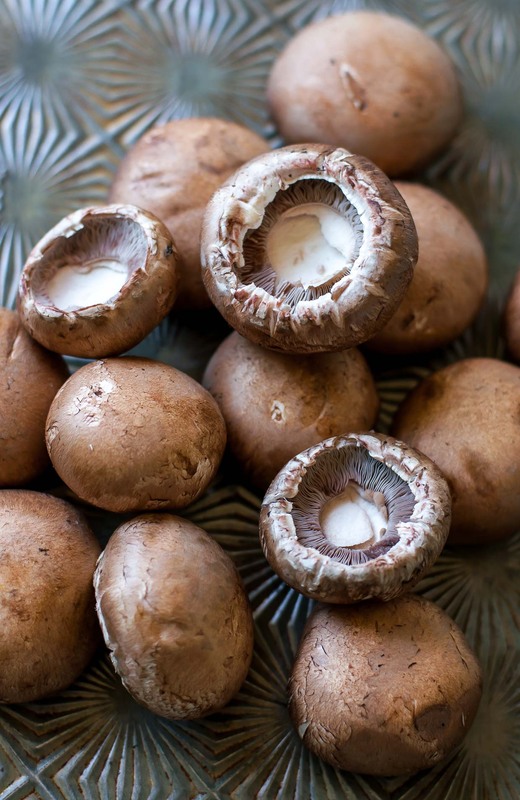 Clean mushrooms with a damp paper towel + remove stems. If using panko, lightly toast it by bringing a skillet to medium high heat with a drizzle of oil. Add panko and toast until golden, stirring frequently for about 1-2 minutes. Transfer to a small bowl and set aside. Combine goat cheese, whipped cream cheese, green onion, parsley, and mix well. A drizzle of honey would also be delicious here! Spoon a dollop into each mushroom. You can also add the filling to a piping bag or plastic bag with the edge cut off and pipe the filling into the shrooms <-- this method is super speedy if you're making a bunch! Arrange on a baking sheet lined with foil and bake at 350 degrees F for approx. 15-20 minutes, or until filling is warm and mushrooms are tender. Top with panko (optional) and garnish the tray with some extra parsley for a burst of color. Drizzle with balsamic glaze and you're good to go! Dig in and devour while they're hot! No cream cheese? No problem! These can be made exclusively with whipped goat cheese. Garnish with extra parsley and some peppery arugula for plating. These would also be AMAZING on an arugula or spinach salad with ripe tomatoes and a simple vinaigrette. Nutrition facts below are an estimate provided by an online nutrition calculator. Adjust as needed and see post below for special diets and swaps. Gluten-Free: The breadcrumbs are totally optional, skip ’em! Goat cheese scarfing Paleo Peeps: nix the breadcrumbs and cream cheese. T-Rex Chefs: I’ll allow crispy bacon on these. You totally have my permission. Just save me a few, mmk? So speaking of scarfing these parked in front of good ole Netflix, what are y’all watching right now? I finished up Black Mirror (LOVE) and am about to dive into the finale of Mr. Robot (another win!) and literally have zero clue what I’m going to do with myself after this. The BFF insists I need my eyeballs on some Game of Thrones action but I’m hesitant to start something that could literally rob me of all the sleeps. What if I get addicted?! There are like eleventy billion episodes! Mad for Mushrooms? Try these next! Stuffed Mushroom Casserole – NEW! Saw this on montchevre’s Instagram, looks amazing. Mouth is watering and love the no meat option! I’m drooling over these mushrooms! This is definitely my kind of appetizer. I love adding goat cheese to my recipes! YUM! What a brilliant flavor combination. And that drizzle of the balsamic reduction on top is divine! I am always mesmerized by your images Jenn!! What a great glow and glistening you capture on these mushrooms. I want to reach into the screen to grab one! Stuffed Mushrooms are the best and they get looked over way too often. Gorgeous pics too. These look delicious. I’ve been looking for a recipe to make for a super bowl party and these are topping the list..